This template was submitted by Berke Babaoğlu from Turkey, he sent me many templates of Airbus A320 to be published on paper-replika.com. This is the one of them, I plan to post the rest on the future updates. 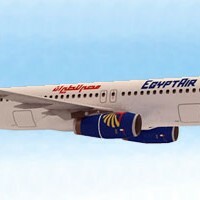 EgyptAir is a state owned airlines, 100% owned by The Egyptian government. Berke recolored this Airbus A320 template still with old livery (2008). Until this model is released Egypt is still in a turmoil, I hope they will have peace soon. This model is the first release of Boeing B-747 series in Airliner category, there will be other livery in the future, just like Airbus series. 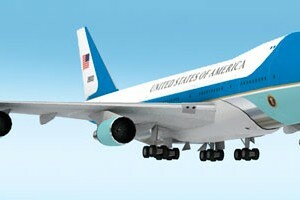 As far as I know there is no paper model of VC-25 Air Force One around in the internet in medium detail level, that is one of the reason why I created this template. This model also the first model that I made for free that is using former inside its fuselage. I use 1:144 scale, the length of the completed model will be 49 cm. I also add display stand patterns along with its former to add strength. I recommend to use 160 gsm plain paper for all parts. This model was submitted by Berke Babaoğlu. Again, Air One is an Italian alirlines which operated in Malpensa Airport, Pisa Airport, Italy. WIth 5 Airbus A320s it focused on low cost filghts. 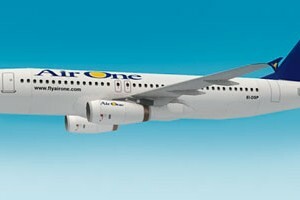 Air One recieved its first A320 in 2010. I also touched the template up a bit and convert it into PDF, the original file was in bitmap format. This template was submitted by Paper Replika Friend (PRF) Jung Jin Suk from Korea. 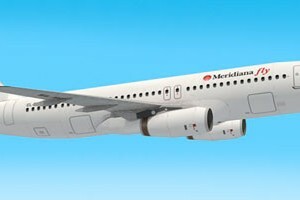 He created this Meridiana Fly A320 template by using A320 master template which I released about 2 weeks ago. I touched up a bit so the file can be reduced in file size. Meridiana Fly is an Italian airlines which operated in Peretola Airport, Florence. It has been using Airbus A320 since 2004 with 17 planes. There are many version of Meridiana Fly livery on this A320, Jung apparently created the simplest one, which doesn't have logo on its vertical stabilizer. After releasing this post I will update the AR.Drone 2.0 contestants model that have been delayed for sometime. Also I have another recolored version of A320 again from other PRF. Many have request to me to make another commercial aircraft beside Airbus, so the next would be Boeing 737 series. This commercial aircraft model was modified from Paper Replika A320 to A321 by Zion. 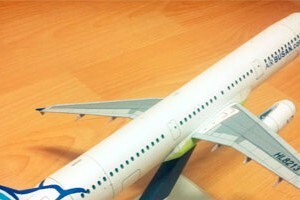 He created a 1:100 paper model of Airbus A321 Air Busan, an airliner from Busan, South Korea. Air Busan received its first Airbus A321-200 on January 2011. It has a pair of A321 since March 2012. Zion emailed me right after I post A320 master template, he told me about his plan to do A321. A321 is one of an A32X family, its member are A318 to A320. A321 is very similar with A320 in shape but with longer fuselage (118%).